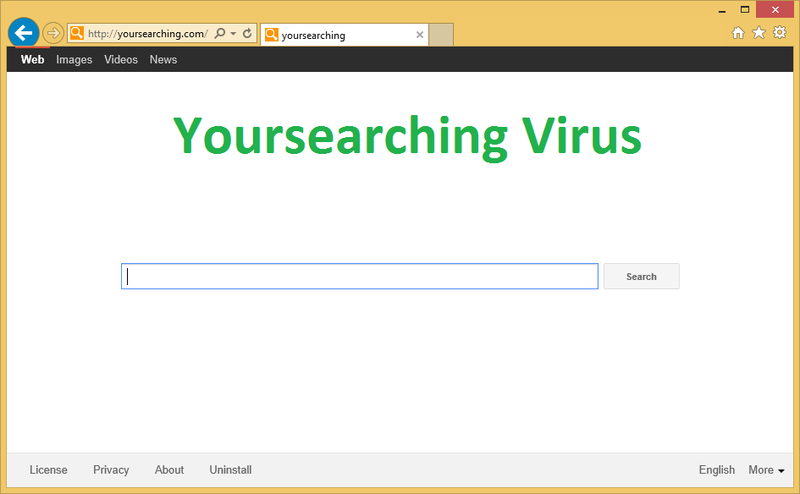 Yoursearching.com, also known as Onesearch.org, is classified as a browser hijacker, which enters your PC with a potentially unwanted and ad-supported application called OneSearch. This adware gets installed onto your computer with the help of free software bundles. It belongs to the same company that is responsible for such potentially unwanted programs as My Speedtest XP, My Current News XP, My Weather XP, and similar. The application may be promoted as a beneficial search tool that can help you find various information online, but we assure you, it is not as useful as it claims to be. We advise that you terminate Yoursearching.com and its related software without hesitation. Once you install the potentially unwanted application, it will change your browser settings including your home page, new tab, and default search provider to Yoursearching.com. This site contains a toolbar, a search box, and links to Terms, Privacy, and so on. The toolbar that appears at the top of the page contains such quick access buttons as AOL, Gmail, Yahoo, Outlook, Hotmail, Google Maps, and Local Weather. It also has a search box. If you enter a query into either one of the presented search boxes, you will be provided with results from Saferbrowser Yahoo Web Search. These results cannot be trusted completely, because they contain sponsored ads and links. After the hijacker’s arrival, you will notice other symptoms as well. It will insert advertisements into your visited pages and reroute you to sites that are completely unfamiliar to you. These activities will negatively affect your online browsing speed. The hijacker’s related program will also lower the quality of your computer performance. If you want to get rid of these issues, you will have to delete Yoursearching.com from your computer right away. Luckily, it is not that difficult to erase Yoursearching.com from your browsers. You can do that manually or automatically. Manual Yoursearching.com removal requires you to uninstall OneSearch from your computer and then eliminate Yoursearching.com from your browsers. If you decide to remove Yoursearching.com automatically, you will have to make use of a malware removal tool Wipersoft it’s FREE to use. The utility will scan your computer and detect the potentially unwanted program as well as other possible threats. You will then be able to delete them with a click of a button. Moreover, the software will stay useful in the future as it will provide you with real-time online protection.